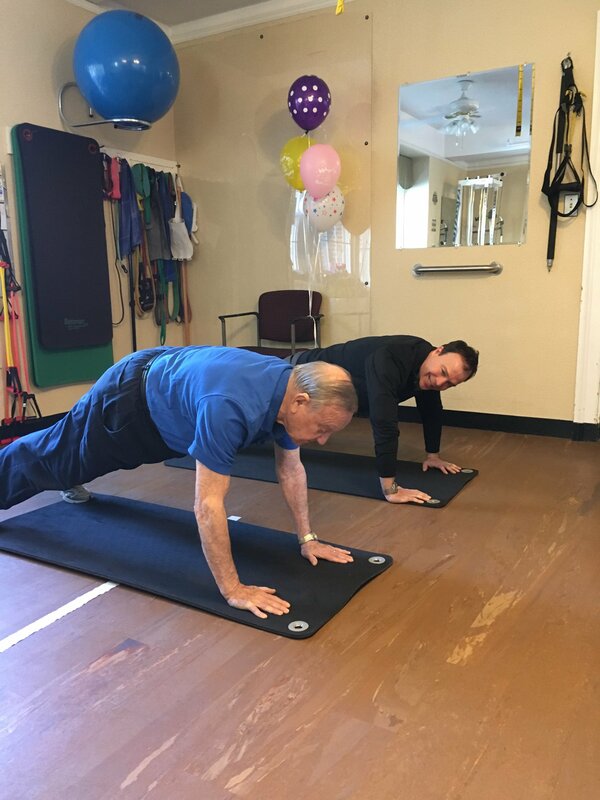 Ninety-year-old Manny Becker chatted easily as he held his plank position for nearly two minutes. Beside him, 51-year-old Jim Altman, Fox 61 news reporter, was having a harder time doing the abdominal exercise and ultimately gave up at 90 seconds. The two had the impromptu competition when the newsman and a film crew stopped by the GoodLife Fitness Center at Jerome Home in New Britain recently. Becker and his wife, Margaret, live in Newington, and have been members of the GoodLife Fitness program since it opened in 2007. He joined the program following hip replacement and now they both exercise twice weekly under the individualized instruction of Maquita Sellers, exercise physiologist. Benefits are evident from the moment he wakes up, Becker said, because it motivates him to get out of bed – and makes it easier for him to rise. The regular exercise has helped him maintain his strength, balance and endurance while increasing his activity level as compared with fellow retirees. Their specialized routines, including pedaling more than a mile on an exercise bike, are modified monthly to build strengths and keep the exercise interesting. As his wife walked toe-to-toe along a line on the floor, he lay on his back bouncing – and catching – a ball off the wall. “You’ve got to keep that blood moving,” he said. With more than 60 years of marriage, three children, three grandchildren and a long career as an engineer at Fafnir Bearing, Becker said he enjoys participating in the fitness program with his wife. “We both reinforce each other,” he said. Learn more about the Good Life Fitness Program here.